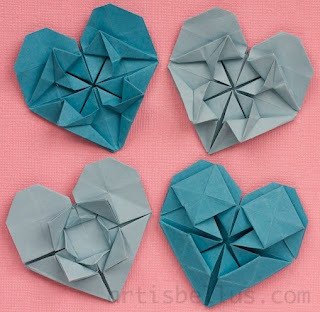 Using the same base as the one used for the Kissing Cranes Heart, I folded smaller heart variations that can be used as presents or to decorate a Valentine's Day card or a scrapbook page. The models in the picture are folded from 4" (100 mm) squares of origami paper that is the same color on both sides. To fold the hearts, start folding steps 1 through 15 of the Kissing Cranes Heart (see the Diagrams page), skip step 16, and then shape the corners, at the top of the model, as shown in step 17. 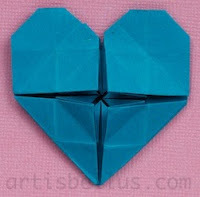 You will end up with a plain heart that has four center flaps, as shown in the picture below. 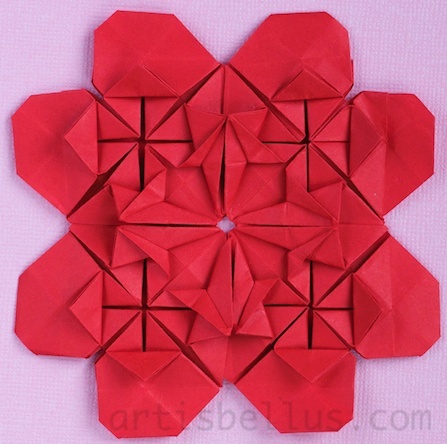 The center flaps can then be folded in different ways to create many patterns. 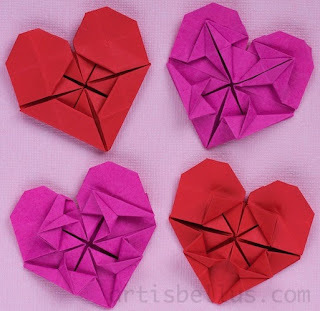 Hermosos Marcela te felicito! Voy a ver si los hago! Gracias Patricia! Después contame como te quedaron! 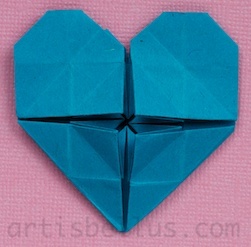 I look forward to receiving one of your ATC hearts in trade! Hi Kathy, I hope we are in the same group for the ATC trade!